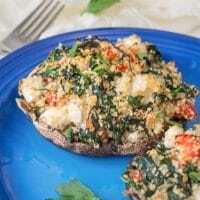 These vegan stuffed mushrooms are loaded with Greek flavors. 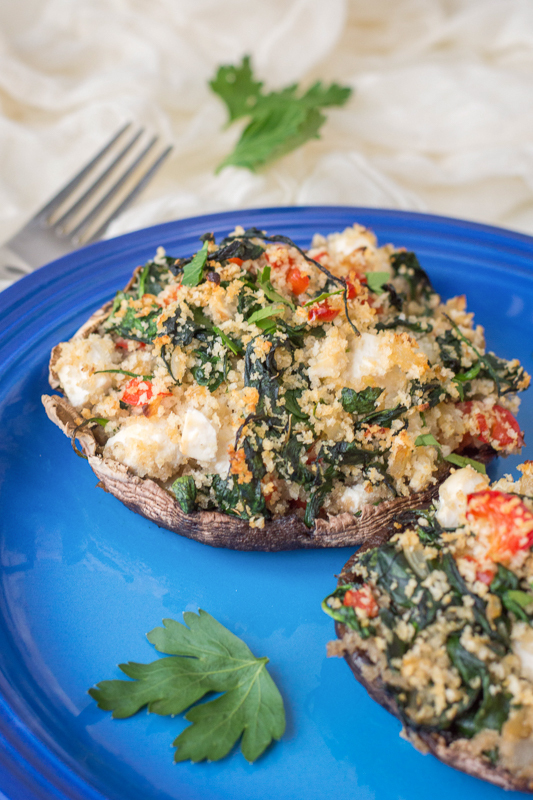 Fresh portobello mushrooms are stuffed with roasted red peppers, spinach, breadcrumbs, and tangy vegan feta cheese. 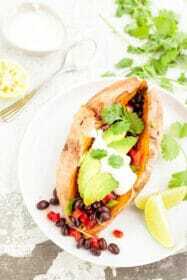 It’s a healthy vegan recipe that’s quick, easy, and hearty enough for dinner. Today, I’m continuing my new series on vegan Greek recipes, inspired by my travels this past year. While in Crete, I was excited to come across stuffed mushrooms on the menu at several different tavernas. 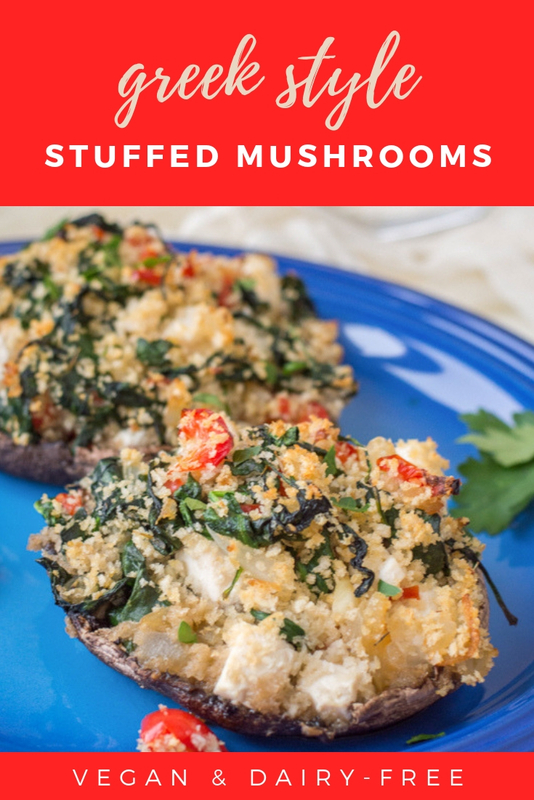 I love mushrooms in pretty much every form – but stuffed full of veggies and breadcrumbs and tangy feta cheese, they were absolutely heaven. So I set out to make myself a vegan-friendly version for home. And I have to say, I’m pretty pleased with the results. 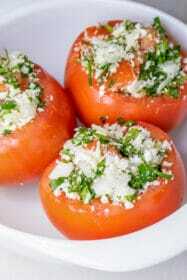 Loaded with Greek flavor from roasted red peppers, lemon, and oregano. And they’re even better when you add a bit of my homemade vegan feta cheese – I swear it’s just as good as the real thing. 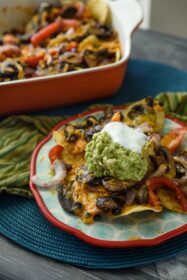 This is a fantastic healthy vegan recipe that’s perfect for a hearty lunch, simple dinner, or even as a fancy side dish. 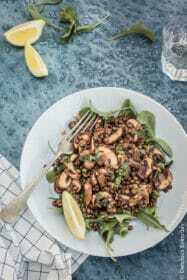 Use the biggest portobello mushrooms you can find! 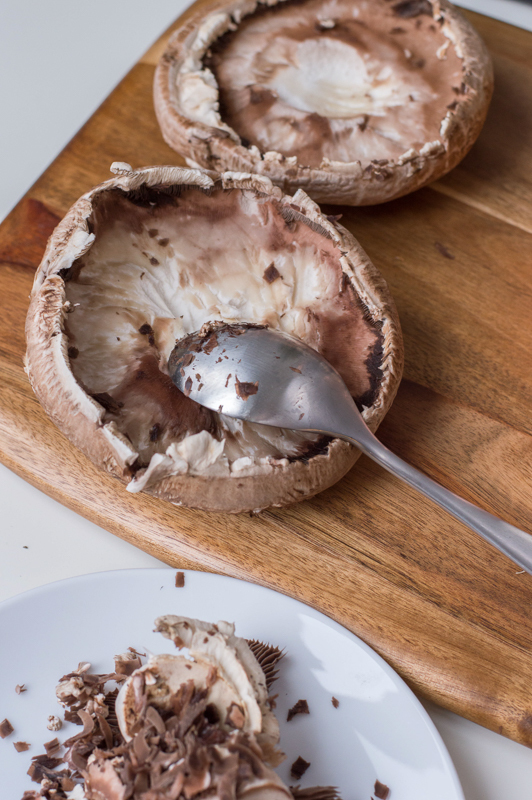 When cleaning your portobello mushroom caps, just wipe them gently with a damp paper towel. This is better than rinsing them under running water, which makes them soggy and keeps them from absorbing the flavors of your ingredients. I used jarred roasted red peppers for convenience. 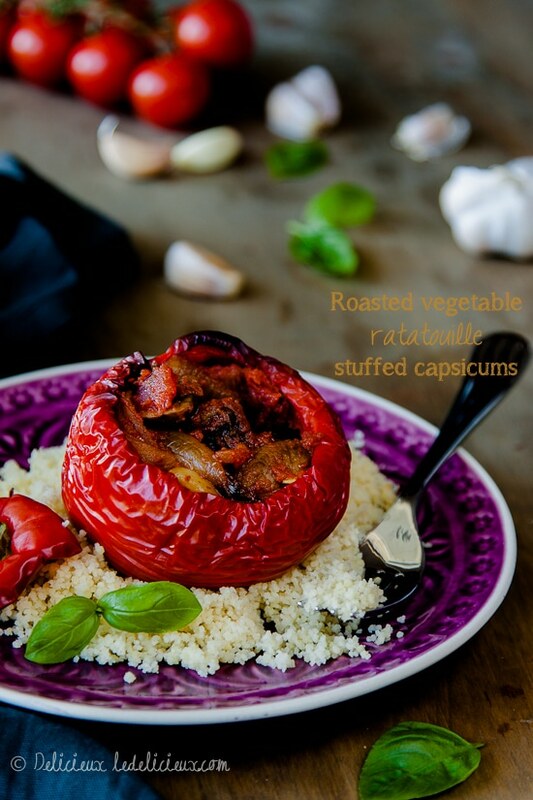 But if you have the time – try your hand at roasting red peppers from scratch! The vegan feta cheese is optional, but it really is worth the effort. 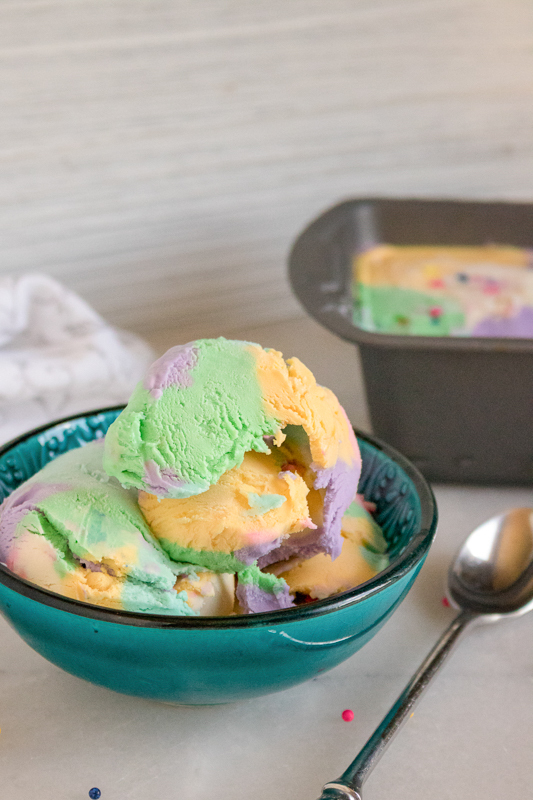 Make a big batch and keep some in the fridge for easy access. If you want to spice things up, add a bit of crushed red pepper to the stuffing. 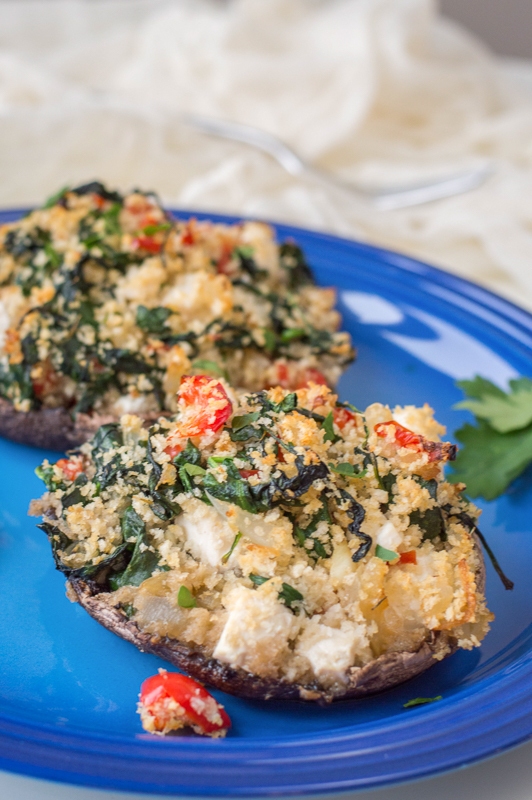 These vegan stuffed mushrooms are incredibly easy to make – perfect for a weeknight dinner! Start by preheating the oven to 375 degrees Fahrenheit. Wash your portobello mushroom caps, and then use a spoon to remove the stem and gills on the underside of the mushroom. Be careful that you don’t break or puncture the mushroom. 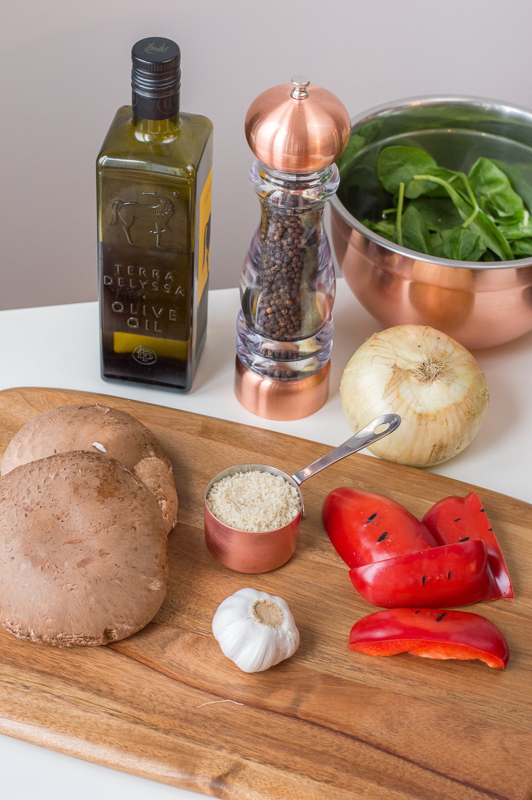 Then spray both sides of the mushroom with olive oil, and sprinkle them with salt and pepper. Place the mushroom stem side up on your baking sheet for later. Next, we’ll prepare the stuffing. In a large non-stick pan, heat 1 tbsp of olive oil over medium heat. 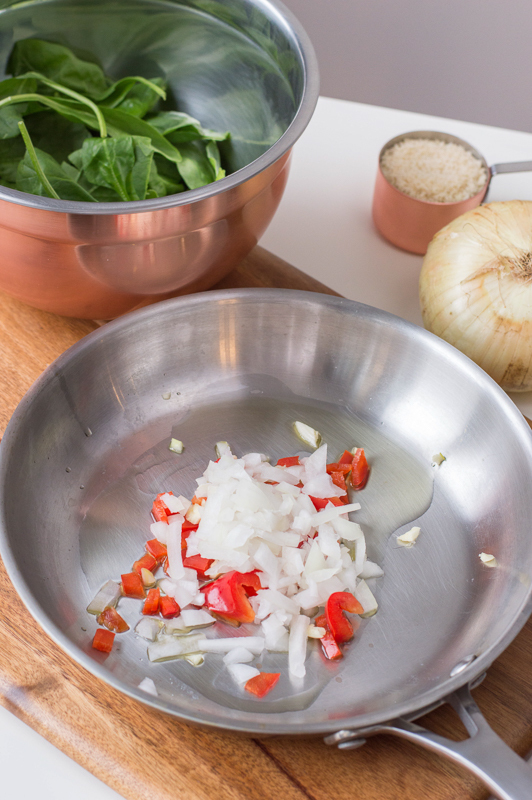 Add the diced onion to the pan and let it cook for 3 to 4 minutes. It will soften. 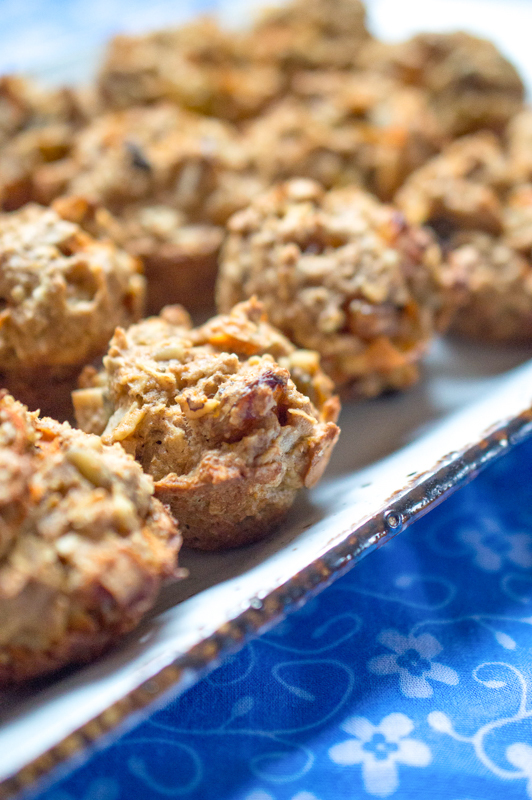 I would suggest using a sweet yellow onion for this recipe as the flavor will come out when you bake it. Then add the diced roasted red peppers, garlic, oregano, and dill. Cook this for 2 to 3 minutes more. Next, add in the spinach until its wilted. This will take about 2 to 3 minutes. Then toss the bread crumbs into the pan and cook for 1 to 2 minutes more. At this point, if you want to add the vegan feta cheese, you can also do that. Once everything is heated through, remove it from the heat. 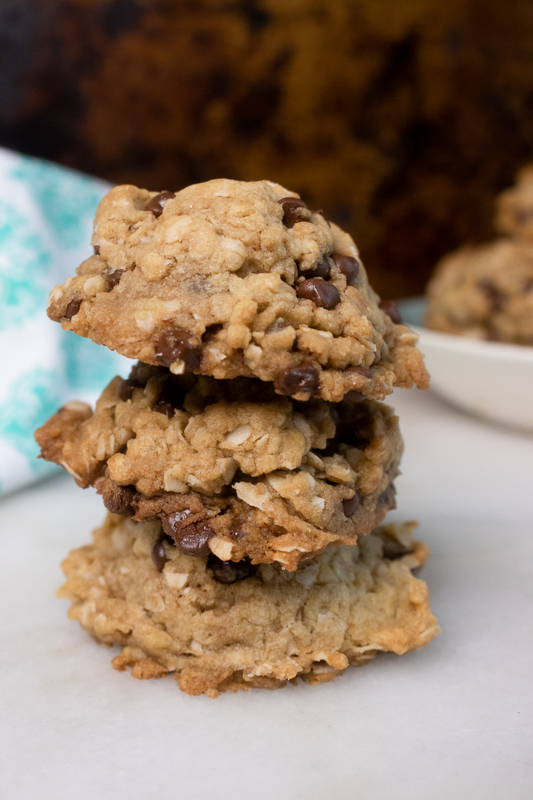 Make sure everything is nicely mixed together and evenly distributed. Then, start stuffing the mix into the portobello mushroom caps. The more stuffing, the better! 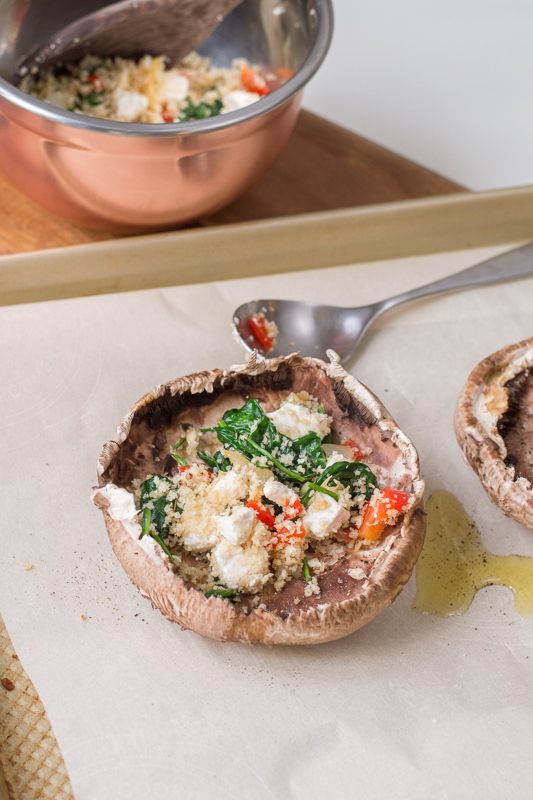 Put your vegan stuffed mushrooms into the oven for 20 to 25 minutes. They’ll come out softened and just slightly browned. And totally delicious! Need more Greek vegan recipes? 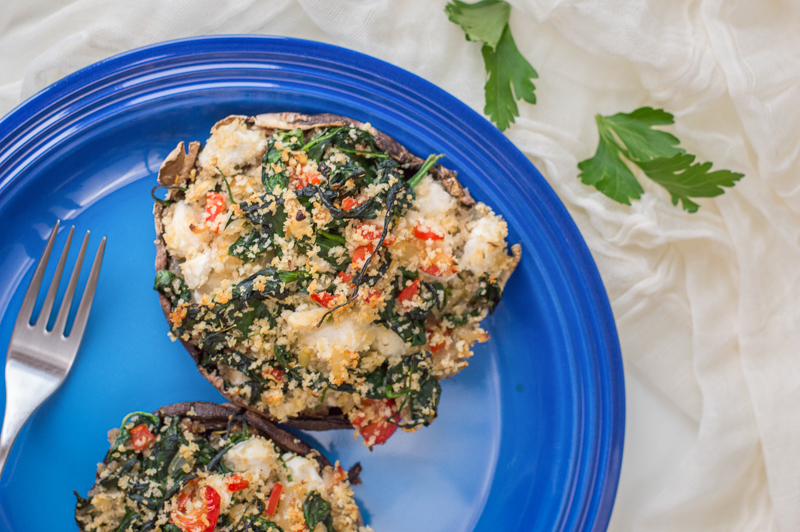 These Greek-style vegan stuffed mushrooms are packed with that Mediterranean flavor you love! 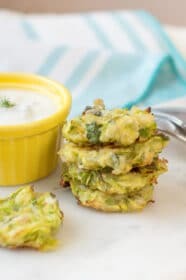 And they're perfect as a main dish or as a side to share! Gently clean the mushroom caps with a damp paper towel. Use a spoon to remove the stem and gills from the underside of the mushrooms. Spray mushroom caps with olive spray on both sides. Sprinkle liberally with salt and pepper. Place the mushrooms stem-side up on a baking sheet. Heat 1 tbsp olive oil in a large, non-stick pan over medium heat. Add onion and cook for 3-4 minutes, until softened. Add roasted red peppers, garlic, oregano, and dill. Cook for 2-3 minutes. Add the spinach and cook until wilted, about 2-3 more minutes. 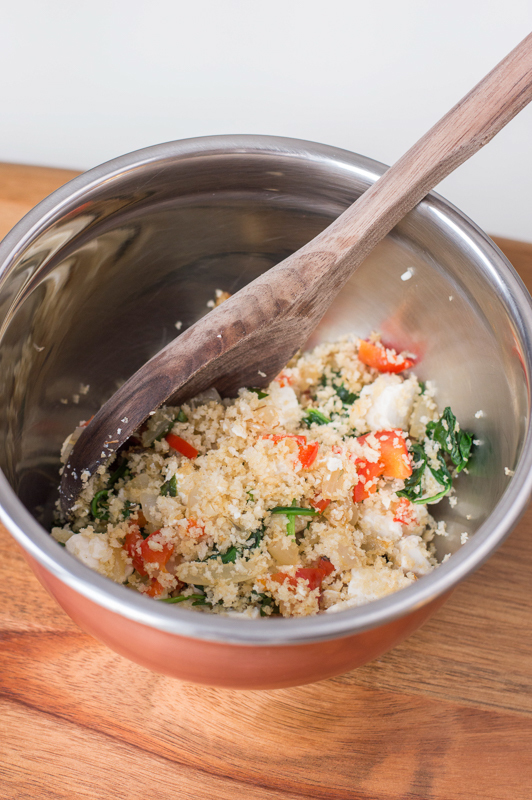 Stir in breadcrumbs and vegan feta cheese (if using). Cook for 1-2 minutes until heated through, and remove from heat. Spoon the filling into the four mushroom caps. Bake for 20-25 minutes, until mushrooms are softened and slightly browned. They look so yummy and nutritious. Will make it for my family this weekend.